Cherry tomatoes are my absolute favorite type of tomatoes, so we always make sure to plant plenty of them each year. Early this season when we made our order for seeds, one new type of cherry tomatoes really caught my eye - an heirloom variety known as black cherry. The description of this tomato promised that the seeds would yield highly prolific, bushy plants that produced juicy, sweet, full-flavored tomatoes. Sounded great to me! And I have to say, these plants have really delivered. I don't even remember how many we ended up planting, but they have gone crazy and each day we harvest loads of their little gems. They are delicious fresh as a snack or tossed into salads, but my all-time favorite thing to do with my cherry tomatoes is roast them. I just cut them in half, drizzle with a little olive oil, sprinkle lightly with salt and pepper, then cook at 400 degrees F for about 20-30 minutes, checking at 10 minute intervals to make sure they don't burn. When they are roasted, the flavors intensify and the juices transform into the most savory, full-flavored sauce you could ever imagine (I like to call it "tomato jam"). Once roasted, if not used immediately, you can store them in the refrigerator for up to a week or you can freeze for up to 6 months. But I have a hard time not diving into them right away! My favorite way to eat them is to toast some sourdough bread, slather on plenty of homemade mayonnaise or goat cheese and top with the roasted "tomato jam" and fresh basil from the garden. It is the ultimate summer meal! What is your favorite variety of tomatoes? This week in the Homemade Living series, I am joined by Mary and our new blogger Jackie in posting about how we incorporate homemade items into our lives. Next week Daisy, Staci, and Amber will be up. If you have some free time, please check out the other posts in this weekly series! We love cherry tomatoes. I have never thought of roasting them, YUM! I've never even thought about roasting cherry tomatoes. What a fantastic idea! I am definitely going to try it. My mother loves cherry tomatoes. My grandfather did as well. I love that picture of them cut upon on the bottom. Neato! i'm not a big fan of tomatoes (just in sauce) but they sure are pretty! Tammy...as soon as I saw your harvest of cherry tomatoes, I thought, oh, she has to roast them!! I don't even cut them in half, I let them pop!! And yes, delicious with goat cheese! Those tomatoes look yummy! And I'll have to try your roasting idea. Looks good. I haven't ever tried them, but you make them sound delicious (especially roasted). THey sound amazing. I bet they'd make a nice tomato jam too. My tomatoes didn't do so well this year. I got some, but not as many as I'd hoped. I have heard that the black cherry tomatoes are amazingly good. My favorite variety is German Johnson from Baker Creek, yum!! I LOVE cherry tomatoes! My father-in-law gives us buckets of them every summer. It never occurred to me to roast them... thanks! Yummmmm.......I too love cherry tomatoes! Sometimes they never make it out of the garden...... :-) I also love them lightly sautéed and tossed with a bit of pasta and basil. I have some wonderful brown cherry tomato seeds. Can't wait to get them started for next year! I want to look for those black cherries next year. They're gorgeous. And boy, the sourdough bread with goat cheese and roasted tomatoes and basil sounds so delicious! My my! now that is a lot of tomatoes! oh and, I love your hubbies hat! 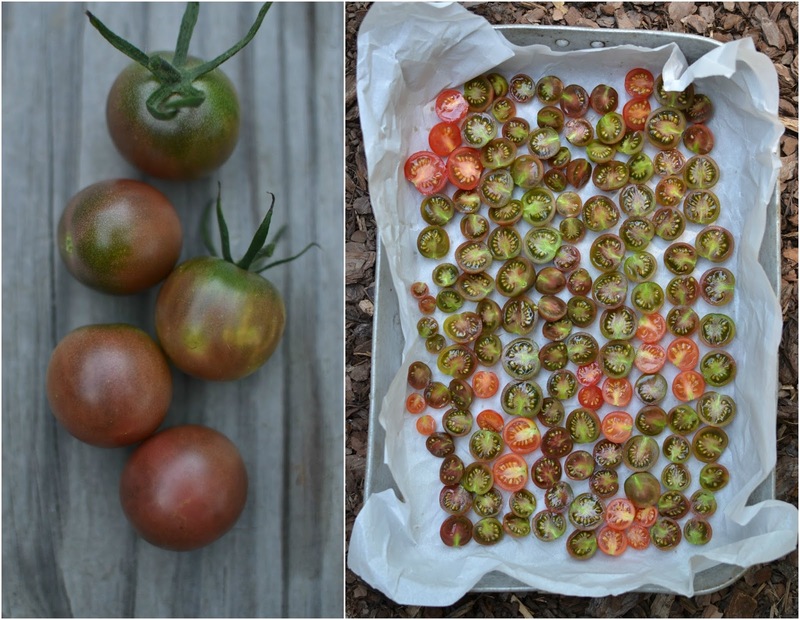 I make roasted or sautéed veggies quite often, but I hadn't thought of doing tomatoes that way. I may have said it before, I love your colander ... and it's so good to see your garden doing so well. I had seen these in a catalog but never tried them. How ever they took first place at the county fair we attended over the weekend. I am going to add them to my wish list for next year. Looks like a great crop you have grown! I'm not a tomato fan in a raw state but lobe them for sauces and juices....I'll have to try roasting them and making the "tomato jam". It sounds delicious! Great idea on the roasting! Will try that this weekend. I tried the yellow pear tomato that I started from seed from a package that I thought wouldn't produce. To my surprise, I have a lot and have enjoyed them and have shared with family/friends. Yummy! I love tomatoes too. I enjoy slicing tomatoes, cucumbers, drizzling a bit of Raspberry Vinegar on and tossing some mozzarella cheese on...yummy! Mmmmm, they look delicious - and I love the idea of sourdough bread with goat cheese and these delicious looking roasted tomatoes! These look delicious. I love ALL tomatoes but we love the orange/yellow cherry tomatoes - not sure the name but heirloom tomatoes are a win, win, WIN around here too! What a pretty tomato! My mom loves cherry tomatoes, I will have to share this with her. Amish Paste is my favorite, and it roasts beautifully! I love tossing the roasted tomatoes in with some pasta, toss with olive oil. Simply Delicious! They look so prolific! Never tried a tomato I didn't devour! We love also cherry tomatoes! I like the yellow pear tomatoes. cherry ones are good too! YUM! Ohhh I love tomatoes, all kinds but mostly lean towards San Marzanos for sauce and cherries for snacking. Great pics and I love the idea to roast them in halves. I recently had some dried cherry tomatoes that were sweet like a candy snack? They were delish! Wonder if it was the same idea you've done here but sprinkled with sugar? Absolutely love them Tammy and roast them all the time. Delicious and nutritious:) Your garden harvest looks bountiful! I have orange cherry tomatoes this year that are the sweetest, most delicious things, but can I remember the name of them right now? No! I like my Marvel striped for the prettiness factor, and the Tigerella tomatoes...so many great tomato possibilities out there! Tammy, I love tomatoes! And the cherry tomatoes taste sweet to me! Your sandwich sounds yummy! Have a happy evening and weekend ahead! I am a tomato lover too. I would like to know more about freezing them after cooking. How do you use them after you defrost them? Never heard of that variety. They look amazing. They are so good on homemade pizza! Those look absolutely delicious and so pretty, great color! Beautiful tomatoes! I have heirloom cherry tomatoes, they are tiny and my kids love them since they are popable :) I roast tomatoes frequently, they are so good with goat cheese and bread! Ooh! The photo of your garden & all those rich looking halved tomatoes are just divine! We've had an abundance of cherry tomatoes for the past month - I keep a big bowl full out at all times for snacking. They are my husband's favorite and Lilly's too.. she likes them cut in half with a little salt. I am going to try roasting them! This is the second post today I've read about roasted tomatoes! I'm sold! I can't think of a better way to preserve, and enjoy the summer taste of tomatoes! I haven't tried them! You have just given me a great meal idea, can't wait to try them. Thanks Tammy! Have never heard of these before!! It would be a learning curve, deciding when they are ripe to pick. Your tomato plants looks very healthy!! they do sound delicious! I didn't even know there were black cherry tomatoes. Great images as usual!